One of the founding members of the Jewish community in this city, and a signatory to the original constitution of the Hebrew Congregation of Kingston, Joseph Abramsky and his wife Chaia arrived from eastern Poland in 1890. He started out as a pedlar of dry goods, and lived initially at the corner of Princess and Division (now the parking lot of Shopper’s Drug Mart). By 1903, he took up residence and set up shop as a clothier at 259 Princess. The store eventually expanded to sell furniture on the second storey; the Percival Furniture Company was an offshoot business that eventually spread to the nearby cities of Belleville, Peterborough, Brockville, and Smith Falls. 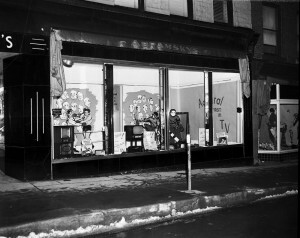 After 86 years of serving the Kingston community, Abramsky and Sons was closed in 1977. 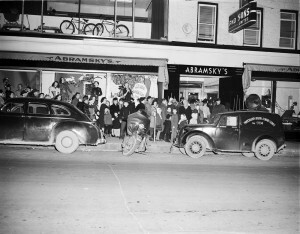 As was the pattern, Joseph Abramsky moved to Kingston because he had family connections here: his cousins, the Abramsons. In time, he in turn raised enough money to send for four of ten siblings. The venerable Grand Theatre is Kingston’s longest-running entertainment venue. But there were several other entertainment venues, including the Princess, competing with the Grand throughout the early decades of the twentieth century. In the 1930s, across the street at 262 Princess Street, was a cinema called the Tivoli. One could spend an entire afternoon watching movies for seven cents a pop. Mort Abramsky and his brother Joe used to spend hour after hour at the Tivoli, agog over the serial adventure films (the type emulated by the Indiana Jones franchise), Tom Mix westerns, and other B-movies pumped out by Hollywood. It got to the point that their father, Harry, made a transparency that was handed to the projectionist. It read: “Mort and Joe: If you’re in here, get your tuchuses over to the store and do some work” (or words to that effect). By 1935, the Tivoli was gone. Taking its place was Ben Palmer’s Modern Furniture Store, which is still in business. Extensive renovations were required; for instance, Palmer had to level the floor, which slanted downwards, before opening up for business.